Over the last couple of months, Google has been releasing a series of interesting updates to Google Forms. 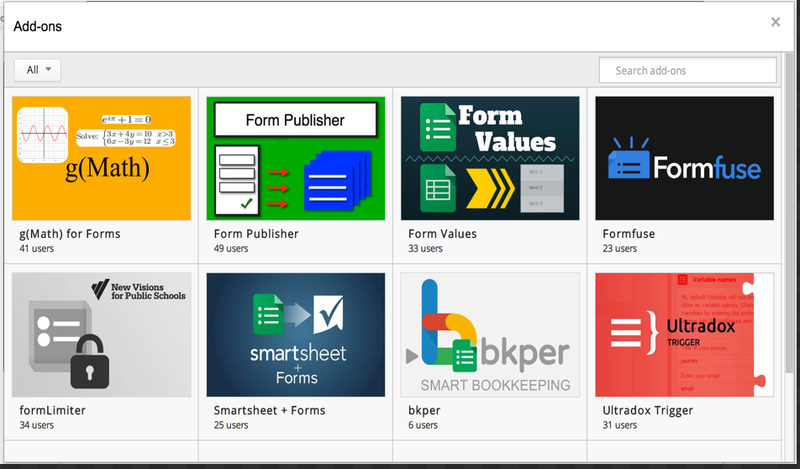 After allowing users to create and use their own personalized themes in Forms, today Google introduced add-ons for Forms. Just like add-ons for Docs and Sheets, Forms users will also be able to make use of third party add-ons to enhance the look and performance of their forms. Add-ons, for those of you not yet familiar with them, are applications designed by third party developers not affiliated with Google. Anyone with the necessary know-how can draw on Google's Documentation to design add-ons and publish them on add-on store. The importance of add-ons is that they add extra functions and services to your Docs, Sheets and now Forms. In other words, using add-ons will enable you to do more with your docs, sheets and forms than you would normally do without them. For instance, using the FormLimiter add-on in your Forms will let your survey close automatically after a maximum number of responses is reached or at a date and time of your choosing. As of right now, the Forms add-on store counts only a few apps but more add-ons will be launched in the coming weeks as developers work their way through them.